Can 'Fear' extend 'Walking Dead' franchise? The last time AMC premiered a prequel, the result was a new cable television ratings record. Can the channel do it again with "Fear the Walking Dead?" "Fear" starts on Sunday night. Fans of "The Walking Dead" have been anticipating this spin-off for months. And so have AMC executives. If "Fear" thrills enough viewers, it'll potentially add years of life to the "Walking Dead" brand. 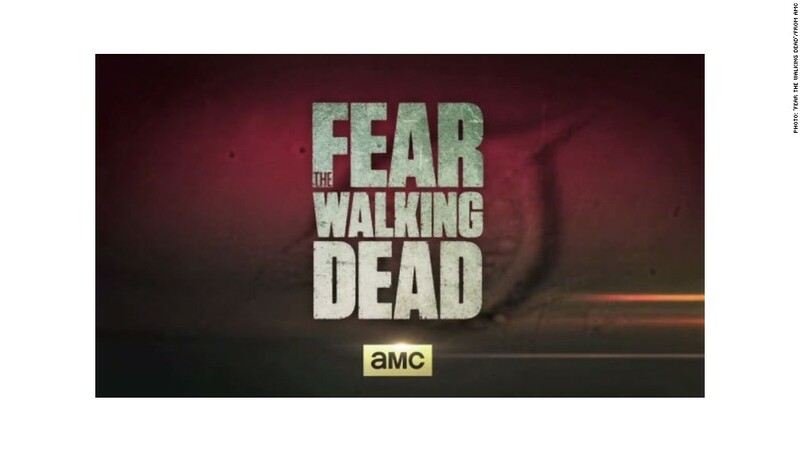 Unlike the original series, which follows a band of survivors on the East Coast after a zombie apocalypse, "Fear" is set on the West Coast right before the apocalypse. Characters see their friends getting sick but don't know that they're about to become zombies. Some families plan for the worst while others are totally unaware of what's coming. AMC president Charlie Collier says the timing is partly what makes the show special. "The viewer knows so much more about what they're facing, and what they're going to face, than they do," Collier told CNNMoney. "So it's a very different viewing experience" from the original series. The original "Dead" was a surprise hit when it debuted in 2010, scoring 3.6 million viewers ages 18 to 49, AMC's most prized demographic. It kept growing from there, and it now stands as the most-watched show on all of TV in that demo. The most recent season finale attracted 10.4 million viewers ages 18 to 49 and 15.8 million overall. So it makes both financial and creative sense that AMC is trying to expand the franchise by starting a second show. Some TV critics have questioned whether the offspring "Dead" will seem too similar to the original, particularly once the zombies take over Los Angeles. There have been some unflattering comparisons to CBS's spinoffs of "CSI" and "NCIS." But the producers say the characters' stories and the location will set "Fear" apart. They typically call it a "companion" series, not a prequel or a spin-off. With the original series, "the question we've gotten more than anything is, 'What's happening in the other part of the world? What happened before Rick woke up?' This will address that," Collier said. AMC has succeeded at this once before, with "Better Call Saul," the "Breaking Bad" prequel that debuted back in February. That's the bar AMC will try to leap with "Fear." Collier said some of the same principles guide both new shows. "If you look at 'Better Call Saul,' one of the great challenges we faced in going into this season was very specifically to make sure we weren't trying to create season 6 of 'Breaking Bad,' but rather create season 1 of 'Better Call Saul,'" he said. With "Fear," there are no plans for any crossover episodes featuring the characters from the original show, according to AMC. "People will be surprised that these new characters are compelling and have different issues," Gale Anne Hurd, an executive producer on both shows, told CNN.com. "Many of our viewers will actually be ahead of the characters in terms of knowing what's coming."